Thank You !! For visiting Gorman Motorsport Rentals. Our mission is to create safe off-road fun and adventure at an affordable price. We rent off-road motorcycles. We offer delivery into the Hungry Valley State Park for a small fee of $5. From young to old, beginner to intermediate. We offer a FULL RANGE of trail dirt bikes and quads for almost every person's ability & size. We offer elbow pads, knee pads, gloves, and goggles at no additional charge. We also have boots and helmets for only $5. We are located just 1 hour north of Los Angeles on the I 5 in Gorman. Just drive up, ride, and leave! WITH OUT THE HASSLES of buying, maintaining, towing, registering and cleaning a motorcycle. 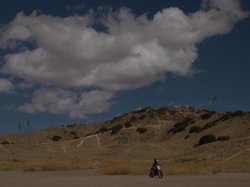 Hungry Valley State Vehicular Park is the most prestigious riding area in all of California. Throughout over 19,000 acres, it offers more than 130 miles of maintained trails. Riding in Hungry Valley is like a never ending ride on your favorite rollercoaster! From 1st time beginners to experienced riders, the Park offers a fun challenge for everyone. New riders will enjoy miles of smooth rolling trails with minimal rocks while the more experienced riders can seek out hill climbs, rocks, sand and single-track. Also for the advanced riders are hundreds of miles of challenging single-track through the neighboring Los Padres National Forest. Each season gives the Park something interesting for riders to enjoy. The occasional rain keeps down the dust and sometimes offers great fun in the mud! Leave the bike dirty at no extra charge. Spring offers riders with a world renowned flower show, running streams, and perfect temperatures. Summer gives long sunny days with a cool afternoon breeze. No matter what season always bring lots of water! The park offers hundreds of campsites with shade, bathrooms, and fire-rings. Come enjoy a day of fun and adventure. Better yet enjoy two! We give an additional 5% off for second day. Camp out and treat yourself to a spectacular astronomy show through clean air and without light pollution.